So in other words, the "Arab Spring" was not a pro-democracy uprising, it was instead, a region-wide US-funded campaign for regime change. The resulting regimes included two Muslim Brotherhood regimes which colluded with the US-Israeli-Saudi campaign against Syria, a brutal war that has left the nation of Libya decimated and in the hands of extremists, and an ongoing war in Syria that has seen tens of thousands dead and with the West directly arming, funding, and codding Al Qaeda, even on NATO-member soil. If the Thai protests then, "stand out," that is a good thing. Throughout Fuller's hit piece, we can see the same exact omissions made by other propagandists across the Western media. These include the dismal human rights record of Thaksin Shinawatra including the mass murdering of 3,000 in a 90 day "war on drugs" in 2003, many of whom had nothing to do with the drug trade at all. Fuller also fails to report how Thaksin's brutality is not only seen as acceptable by his followers, but the campaign of mass murder in 2003 was in fact, wildly popular amongst his support base. This above all, is the reason why many feel those who continuously return him to power, despite not being eligible for office (he is a convicted criminal with two arrest warrants out for his arrest), not being on the ballot (his sister, in true 3rd world nepotist fashion is running as a placeholder for him), nor even being in the country (he currently resides in Dubai), are not capable of participating in elections until serious reforms can be carried out. Reforms are aimed at closing the loopholes that have allowed a convicted criminal to run in 2011 under the motto "Thaksin Thinks, Puea Thai [his political party] Does." Thaksin literally campaigned for his sister, and openly runs the country via Skype and meetings with regime ministers outside the country. 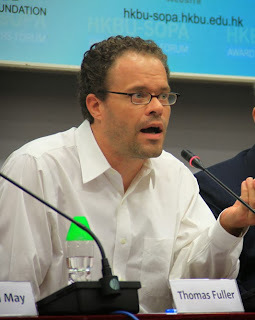 What Fuller describes is an almost cartoonish example of 3rd world corruption, nepotism, and wrecking ball abandon for the rule of law - yet curiously, Fuller has a difficult time wrapping his mind or his editorial around the fact that this banana republic-style corruption exhibited by the regime he has documented in his editorials, propped up by the same interests behind an "Arab Spring" the paper he writes for exposed as being foreign-backed subversion, is precisely why anti-regime protesters are on the streets of Bangkok today. It has nothing to do with wanting "less democracy," because a regime like that headed by Thaksin Shinawatra was never about democracy in the first place. Thomas Fuller is an intelligent man and undoubtedly knows this. He is doing just what his counterparts at the BBC are doing, just as lobbyists working for Thaksin Shinawatra are doing - manipulating public perception for the corporate-financier interests that were behind "good" protests like the "Arab Spring" and the current pro-EU Nazis clamoring in the streets of Ukraine, and opposed to "bad" protests like the nationalist-driven, pro-sovereignty movement in the streets of Bangkok now.